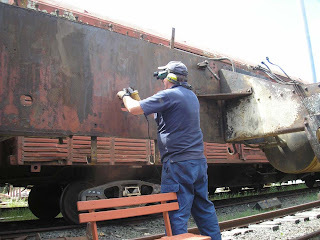 This Sunday's workday was a fairly quiet one, with Alan playing gaurd on the train to Bungendore and both Andy and Gavin traveling to Bungendore and back on the gangers trolley as fire protection. Peter R left early to drag the hydrostatic pump back to Sydney following the succesful tests during the week. There were two new workers today, Paul Evans and Vince Patrish (sorry Vince, I know I have spelt this incorrectly), welcome to you both. Work has started on cleaning and painting the centre frame. 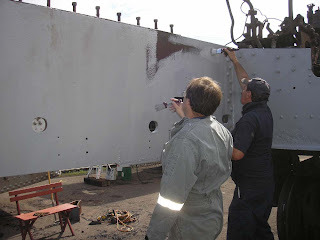 Panic Pete Gleeson and Paul got started with wire wheels and followed with primer on the area inside the frames, near the firebox. Vince was a late arrival but made up for it helping with the painting. It is amazing what a bit work and some paint can do for the appearance. Marc and Mike worked on removing the superheater header from the old boiler. 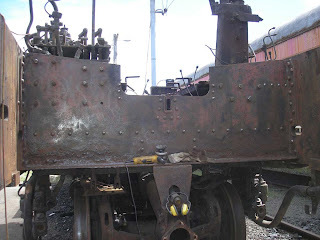 The smokebox door and front plate are off and work has started on getting the throttle shaft removed to allow the header to be removed. a few of the castings that fit around the throttle shaft are broken and will require replacement with fabricated units. 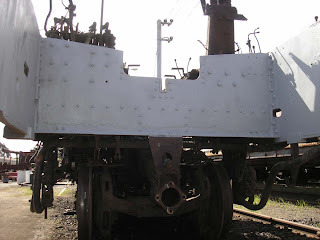 The next workday should see the header out, when the attentions will turn to the steam dryer and dry pipe that need to be moved to the replacement boiler. The next workday is Saturday 1st of November...See you there!